Since the day I mentioned that I was working on an HTML-based bootstrapper, I began getting a regular stream of e-mails asking about my progress. I even get phone calls. It’s a very similar experience on the WIX mailing list where a question pops up about Burn, the WIX bootstrapper, now years in the making. So here it is, you can stop leaving me voicemails now and start playing with the first well-featured builds. We want a bootstrapper with as much control of the UI as humanly possible. Download the latest dotNetInstaller. You’ll find htmlInstaller.exe in the distribution. This is a UI driver based on HTMLayout and behaves very much like the existing dotNetInstaller.exe. These two now share the same execution engine and differ mostly in UI. Both support chained configurations, downloads, etc. You can run htmlInstaller.exe on an existing bootstrapper configuration. This is what you’re going to see. Looks familiar? Unlike the dotNetInstaller.exe UI, this is a UI written in HTML rendered in an embedded browser. You get some new features, such as minimizing, maximizing and resizing of the window, right out of the box. And because the renderer is HTLM, controls flow and sizes adjust normally as in your browser. And because it’s HTML you will be able to skin the bootstrapper completely – those top bar buttons and the resize grip are also rendered by the HTML engine. 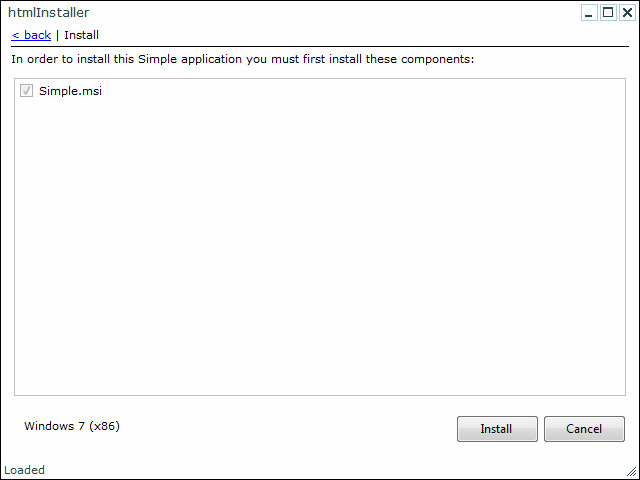 Hit Install with a working configuration. You’ll immediately notice that the progress bar is now embedded inside the bootstrapper UI. I got rid of the infamous K-2000 progress popup and replaced it with an HTML widget. Obviously, it’s completely customizable, and as any other control, optional. You’ll still see prompts and errors in dialogs. 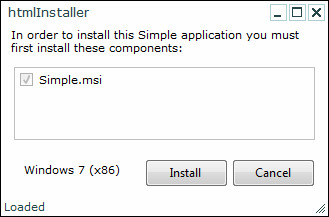 Installers continue to show a separate UI, since the bootstrapper still runs msiexec for MSIs. I do plan to host the MSI installation eventually and provide a single progress bar through the entire process. Failures and bootstrapper prompts will end up being displayed in the bootstrapper UI itself in the 2.0 release if I can make it work. Let’s look at the HTML source in this bootstrapper and see how we can make changes to it. There’re two documents embedded with htmlInstaller by default: index.html and style.css. We’ll ignore the stylesheet and focus on the index.html page, examining it top-to-bottom. This is a standard HTML page with an html opening tag, a head and a body. The stylesheet is imported with a custom HTML tag, @import – HTMLayout-specific tags are documented here. There’re a few built-in widgets defined by their id’s. All such widgets are optional and have well-known behavior within the bootstrapper. Let’s customize the bootstrapper UI by adding this picture. We can insert an img tag anywhere in the HTML. We must now embed the picture with the bootstrapper. 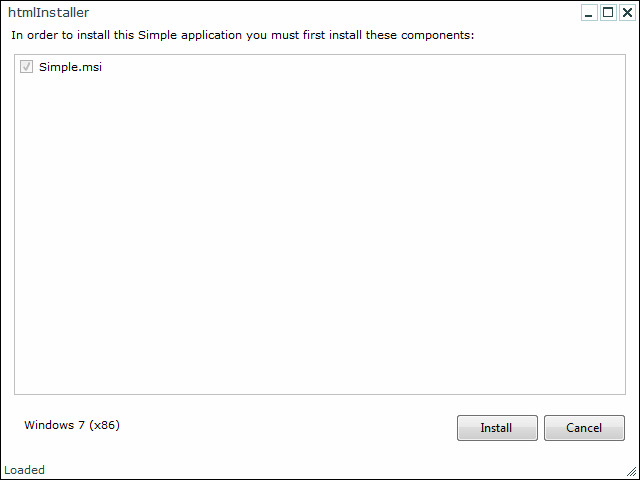 This can be done with a new /EmbedHtml parameter to InstallerLinker.exe. For testing you can also put all files, including htmlInstaller.exe in the same directory and run htmlInstaller.exe /configFile Configuration.xml. If a local index.html exists, it will be picked up. 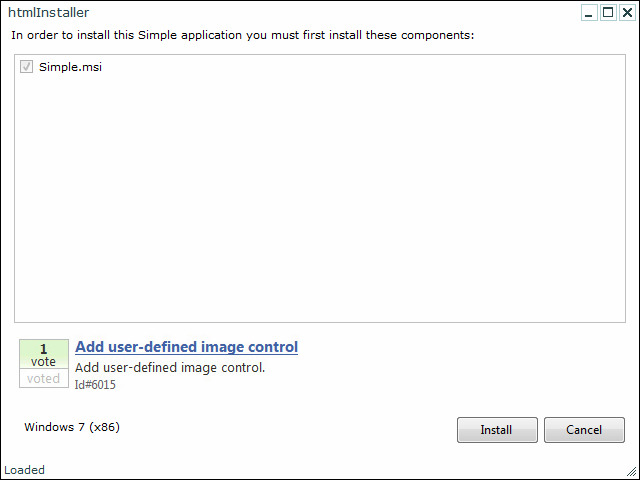 This produces Setup.exe that includes all the HTML files and our picture in the Samples\HtmlSetup\Picture folder. Note that the HTML UI resized the component selector automatically to insert the picture, as expected. You can now easily see how to create a basic workflow with two pages. Replace index.html with a welcome page and create setup.html with a new link back to the welcome page. For my day job needs I’m hoping to enable multiple configurations that a user can choose from within the same bootstrapper. My goal is to allow the end-user to choose scenario-based installs within a single package. Remember that this is very much work in progress. Don’t expect everything to work. Basic Workflow with htmlInstaller: HTML-based bootstrapper for DNI was published on August 06, 2010 . See a typo?